As 2015 comes to an end, it’s difficult for me to resist a year-end countdown, so here you go – a recap of the My Rick Springfield Crush blog. Since its first post in August 2014, this blog has had more than 7,000 hits (with more than 6,700 in 2015). More than 3,900 people visited the site from 64 countries – mainly from the United States. The majority of 2015 blog views – more than 2,100 – were the home page/archives. 3. Walkin’ In video, what a great gift! I realize that most of these views are from people who randomly arrive at this blog during a “Rick Springfield” search (except for the two people that I know in real life who are only reading this because I’m writing it and not because of the subject – hi there), but it’s still pretty cool. When I first started this blog, I explained to a friend that I was doing it because I felt compelled to write it, to get my thoughts out of my head and make sure I don’t talk about it too much with the people around me. She asked me why I would do it so publicly, why not just write it in a journal? Well, I have a stack of notebooks that I’ve written in over the years that were stored in boxes in the garage for years until I started this blog. I pulled them out to uncover any memories of my long-ago buried RS crush. Pages and pages and pages of scribbled words filling notebooks – documenting various experiences in my life and writing songs – that would have likely stayed in the boxes until I died and eventually been thrown into a big recycling bin to be transformed into paper towels. Relics from a time before blogs. So that’s why I started this blog. So that maybe others like me who have a RS crush would read it and know that they are not alone in their addiction. And I guess I picked a good year to start the blog because although I wrote in a post back in June that I wasn’t sure how long I’d continue writing the blog because I wasn’t sure what else I could say, I’ve written more than 60 posts since then (today’s post marks #145.). Also this year, I was fortunate to see RS in concert four times, and each concert had their special moments. In March, I saw him for the first time in about 15 years on what would have been my mom’s 70th birthday – with my best friend from high school, who I saw him in concert with in high school and in 1999. Plus I got to briefly meet him afterward and hand him a piece of paper with a link to this blog (not sure if he ever read it though). Then in April I saw his “Stripped Down” show with my husband (who is now a fan and is reading his memoir, “Late, Late at Night“) and we both met him briefly after the show. So yes, it’s been a good RS year. And in 2016, there’s Rocket Science (Feb. 19) and “Traces” (new movie – not sure when). And hopefully some more concerts. Thanks for reading this! May you have a happy and healthy 2016 – the year of the “Human Touch”! Walkin’ In video, what a great gift! Many thanks to Jenni for sharing this video of “Walkin’ In,” from a Stripped Down concert in Clearwater, Florida, this past March, which was the first time Rick Springfield played this song live. With her permission, a link to the video is posted below. 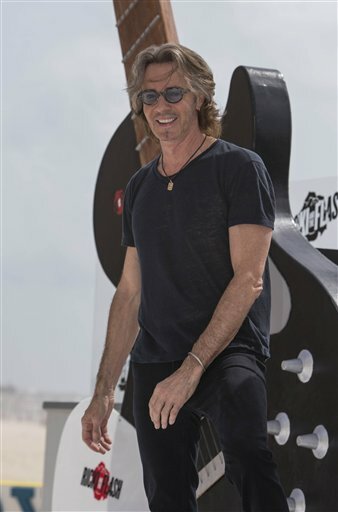 Much has been written about the community of Rick Springfield fans (OK, maybe not MUCH, but there was a documentary about it: “Affair of the Heart“) – people who have gotten to know each other well from attending concerts across the country and fan events during RS’s long career. For instance, they raise money for charity for Rick Springfield’s birthday and organize a Christmas card exchange in December. Recently the daughter of one of the “Rick Chicks” (or “Rick Sistas”) reached out to fellow fans because their family is going through a difficult financial challenge due to health issues. So, in the spirit of the season of caring and sharing, here’s my pitch to help a fellow fan. Their family business makes healthy homemade treats for dogs and cats. So if you have a furry friend that you want to spoil for the holidays, here’s their website: Maxx’s Munchies Pawkery. Click here for the video of “Walkin’ In.” The song will be on the version of “Rocket Science” that can only be purchased at Best Buy. So here are the lyrics to the first song released off Rick Springfield’s new album “Rocket Science.” (Available in a few different versions on Feb. 19, 2016). The lyrics seem very accurate, right down to the “Mmmmm yeah,” although it’s difficult to discern if that’s the exact number of ms.
We’ll light this party up. I received the COOLEST gift in the mail today! It was the Secret Santa gift that came with an order from Rick Springfield Official Merchandise. To some, it may look only like a piece of notebook paper with some words scribbled on it, like maybe somebody accidentally stuck a piece of stained paper from a cluttered desk into the envelope before sealing it. But it is actually a treasure. The writing is difficult to read, but do these words sound familiar to you? And on the other side are the lyrics in progress for “Everybody’s Girl,” along with chords listed above some of the words and some lines crossed out with new words scribbled in on top. One of the things that makes it so cool is that it’s like a time machine back to when RS was working on “Working Class Dog” and before he hit his big success. When he was writing these words, he was on the brink of “making it big” yet he didn’t know it yet. At the time it was just a piece of paper – one of many – with his lyrics on it but nobody else had ever sung them yet. And now a copy of that piece of paper has arrived at my house about 35 years later, (and is now in a plastic sheet protector) and I was singing the melody as I read the words. So weird, and incredibly cool. Thank you to those at Rick Springfield Official Merchandise! Got to see some of tonight’s “Stripped Down” show in San Diego – thanks to those who shared on Periscope! The new “Jessie’s Girl/867-5309/Stacy’s Mom” mash-up is great (and I noticed a few seconds of “My Sharona,” too in tonight’s version). And there was a funny little message to the airlines, too, in a separate song. 5. Miss Mayhem: a “blues-infused rocker,” on which he collaborated with indie artist Tad Kubler of the band The Hold Steady. 6. Pay It Forward: “Imbued with a sense of spirituality” and he mentioned at a “Stripped Down” Q&A that this is his favorite song on the CD. 12. (I Wish I Had A) Concrete Heart: See this post from last week. And still no word on the “Walking In” song he played at a Stripped Down show earlier this year and said it was going to be on the new CD. The official audio of “Down” from Rocket Science was released today. Whoo-hoo! The country influence he’s mentioned about this new album can definitely be heard here (there’s a little country twang here and there, which wasn’t as evident in the live version), but it’s a great song! As RS has mentioned in the past, he wrote the song with Jay DeMarcus of Rascal Flatts on a tour bus during a snowstorm. The lyrics gathered from the live shows weren’t too far off (see this post from September when I tried to decipher the lyrics) but there are still some I’m not 100 percent sure about. I wonder what song will be next? If money wasn’t an obstacle, I would have quite a nice weekend planned. This is what I’d do. After the lunch on Saturday, I would head to the airport and fly to Ontario, California. It’s only about an hour flight, so I’d get in around 4, rent a car and head to the Fox Performing Arts Center in Riverside. It would be too late for the sound check for Rick Springfield’s Stripped Down show that night, but that’s OK because I could purchase a Meet and Greet pass and meet him after the show instead, where I could get a picture with him and he could sign my Stripped Down collectible box set (which I would have already purchased back when it was available, if money wasn’t an obstacle). Then I’d enjoy the Stripped Down show from the front row. Then after the meet and greet, I’d head back to the airport, return the car and head home, ready to wake up the next morning to take my youngest son to his friend’s karate party. But since money is an obstacle, maybe I’ll just scan my Twitter feed and check for any Periscope videos instead. To those actually going to the show (and the one Friday night in San Diego) – have fun! Sometimes it seems like Google has all the answers to the mysteries in the universe. Is this the original version of (I Wish I Had A) Concrete Heart? 11. We Connect: A few lyrics are in an article on MelodicRock.com. On a side note, for the first time in more than 12 years, I played one of my songs out in public tonight, at an open-mic type of program – two mics, actually, one for me and one for my guitar. Since it’s Hanukkah, I played “Shine Your Light.” Although I was kind of dreading it – I’m more of a “behind-the-scenes” kind of person – I was glad I did it. Would this had ever happened if I didn’t come across that Rick Springfield interview on PBS last year? I don’t know. Miss Mayhem: a “blues-infused rocker,” on which he collaborated with indie artist Tad Kubler of the band The Hold Steady. A mention in an interview that “All Hands on Deck” is a patriotic song (“anthemic,” according to this new article). And good news – some additional tracks will be made available in coming weeks before the Feb. 19 release, according to the article. Yay!